You might have gathered from the title that this cake has a chocolate theme (not unlike the first Iron Cupcake London – plug, plug!). 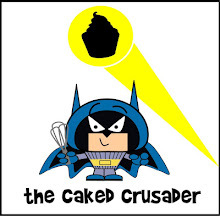 There could only be one flavour for the CCBF’s (Caked Crusader’s Boyfriend) birthday cake and it had to be chocolate. I came to this conclusion based on the fact that practically every dessert the CCBF ever selects contains chocolate in some shape or form. He also possesses an encyclopaedic knowledge of the Simpsons, so Krusty and Homer had to feature too! Just so you don’t expect such good quality photos every week I should point out that the photos in this post that look like they could be in a cookbook were taken by the CCBF, who knows his way around a camera and doesn’t randomly point and click like I do. That’s why he will be the official photographer at Iron Cupcake London. - Line two 20cm loose bottomed sandwich tins with baking paper. - Cream together the butter and sugar until light and fluffy. Do not skimp on this stage as it’s the key to a lovely sponge. - Gradually add the eggs, flour and cocoa powder until fully combined and you have a smooth, thick batter. - If the batter is too stiff i.e. not dropping consistency, add two tablespoons of milk. - Divide the batter evenly between the two prepared tins. Level the surfaces. - Bake for approx 30 minutes until a skewer inserted into the cakes comes out clean. Mine took 35 minutes. - Leave to cool for 10 minutes in the tins before removing from the tins and leaving to cool completely on a wire rack. - The sponges can be made the day before and stored in airtight containers. 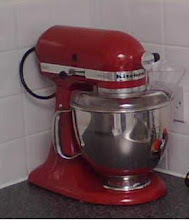 - Now make the swiss meringue buttercream. Place the egg whites and sugar in a bowl over a pan of simmering water. Stir pretty much constantly to prevent the egg from cooking. - After 5-10 minutes, when the sugar has dissolved (when you cannot see any crystals on the back of the spoon), remove the bowl from the pan of simmering water and whisk until the meringue has puffed up and the mix is cool. - Add the butter and vanilla extract to the meringue and whisk until the butter has been completely incorporated into the meringue. At first it will look a disaster – it will collapse and look curdled but don’t worry! Stop when the mixture is smooth, light and fluffy. - Place one sponge on the serving plate and top with a third of the buttercream. - Place the second sponge on top and press down gently to ensure the buttercream has levelled out. - Use the remaining buttercream to cover the top and sides. I could never ask for a whopper, it was the name of my brother's beloved teddy when we were children! Happy Birthday (belatedly) to the CCBF! you always make the most beautiful cakes! You definitely should be proud of those decorations. As always beautiful. That's so cute! I'm not brave enough to venture into cake decorations just yet. 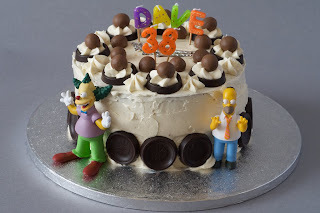 Happy Birthday to Dave (aka CCBF) - what a terrific looking cake. What more could anyone possibly want for their birthday than that cake! It is amazing! I will definitely be coming here for a recipe, next time I think of making a birthday cake! The only thing I can say is; lucky CCBF!!! 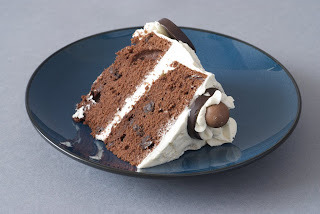 Actually, expand on that - the chocolate chips in the cake look fab and the icing looks great too. Love the decs! so cute.. The Simpson cake.. I think we have the same boyfrield! LOL.Simpson obsessed, loves chcolate, and a good photog.Hmmm. Seriously, that ccake looked perfect. Iron Cupcake London - first challenge announced!